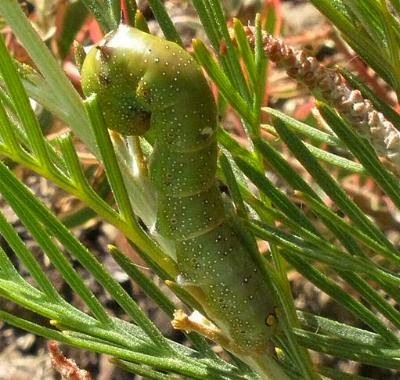 Grevillea looper is the larva of a common native moth that occurs across eastern and southern Australia, including south-west Western Australia. Lavae chew the leaves of grevillea, hakea and occasionally bankisia plants. The larvae are greenish-brown, smooth-skinned caterpillars up to 80mm long covered in white spots. 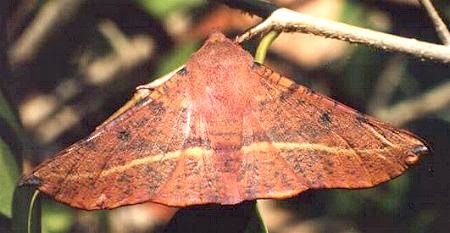 The general wing colour of the adult moths varies, some are pink and others brown. The body varies from pink to brown also. The moths all have a brown or yellow line across the upper surface of each wing and when at rest resembles a leaf. Each forewing has a recurved wingtip, and a small transparent spot surrounded by an irregular dark mark on both the upper and under surfaces. Look for larvae in early summer before they do too much damage. 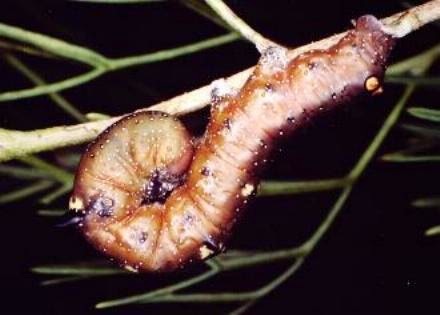 Larvae feed at night and lie along branches during the day, making them very difficult to see. Pick off and squash or feed to birds - Butcher Birds love them. Apply Dipel or pyrethrum in preference to other insecticides but follow the label carefully. Birds, parasitic wasps and flies.